Proceeds from the sale of 2013 colt, My Contribution, will benefit the American Quarter Horse Foundation. My Contribution is a 2013 colt by WR This Cats Smart and out of Dash Back to Me by Dash For Cash. Proceeds from the sale of 2013 colt My Contribution will benefit the American Quarter Horse Foundation. 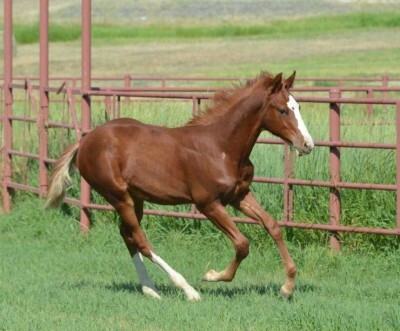 My Contribution, a 2013 weanling by WR This Cats Smart and out of Dash Back To Me by Dash For Cash, will be sold September 7 during the Wagonhound Land & Livestock sale in Douglas, Wyoming, to benefit the American Quarter Horse Foundation. Art Nicholas of Wagonhound Land & Livestock, which owns WR This Cats Smart, and AQHA First Vice President Johnny Trotter and his wife, Jana, who own Dash Back To Me, conceptualized the idea to support the American Quarter Horse Foundation. Dr. Blodgett is a member of the AQHA Executive Committee and the manager of the equine division at the Four Sixes Ranch in Guthrie, Texas, which stands WR This Cats Smart. WR This Cats Smart is a 1999 sorrel stallion by High Brow Cat and out of The Smart Look by Smart Little Lena. He was bred by Wiens Ranch Co. Inc. of Sedalia, Colorado, and was the open finals champion in the National Cutting Horse Association finals in 2005. His foals have won approximately $4.3 million in western performance competition. WR This Cats Smart has also sired a reserve world champion and in 2011 was the AQHA leading sire of NRCHA horses. Dash Back To Me is a 1993 sorrel mare by Dash For Cash and out of Write Me Back by The Signature. She was bred by Joan Dale Hubbard of Palm Desert, California, and had a respectable racing career before retiring to become a broodmare. She had a top speed index of 92 in seven starts with one win. To learn more about My Contribution, visit his pin board on AQHA’s Pinterest page, where you’ll find photos and videos of him in action on the ranch. You’ll also get updates via the AQHA Facebook page at www.facebook.com/aqha1.